Tall Fescue: High-Yielding Forage Grass or Toxic and Invasive Weed? observed a patch of grass that he thought was worthy of further study. He collected and increased (i.e., several cycles of planting and harvesting) the seeds, and in 1943 released the tall fescue variety known as Kentucky-31. Interestingly, this variety now covers the vast majority of the 35 MILLION acres dominated by tall fescue in the United States. In the ‘fescue belt’ of the U.S., this species is highly productive, persistent, and tends to grow even in places where people do not want it. Like orchardgrass, Kentucky bluegrass, and perennial ryegrass, tall fescue is not native to North or South America. One source suggests that it is native to parts of Europe, the Mediterranean, North Africa, the Middle East, and Asia, but it has been present in the U.S. for a long time. Tall fescue is technically a ‘bunch grass’ but unlike orchardgrass and other bunchgrasses it often has short rhizomes (underground stems that travel laterally) and can form a sod. This characteristic makes tall fescue more tolerant of wheel traffic than most other grasses. Tall fescue leaves are more rigid than most other forage grasses, have a waxy cuticle on the back of the leaf, and have prominent veins along the length. Without known exceptions, the leaves feel more coarse than other common forage grasses, a characteristic that often translates to lower palatability. Modern cultivars branded as ‘soft-leafed’ are likely softer than older tall fescue varieties, but they are still much more coarse than other forage grass species. Tall fescue grows well in almost all agronomic soil conditions and is more heat- and drought-tolerant than other cool-season forage grasses. Historically, tall fescue plants have benefitted from a symbiotic association with a fungus (known generally as ‘endophyte’) that grows between the cells in the above-ground plant tissue. This amazing relationship reduces some types of herbivory, improves drought tolerance and generally bestows better fitness upon plants that are infected compared to those that are not. Buy why would people not want a high-yielding drought-resistant perennial grass to grow in their pastures or hayfields? Unfortunately, the most common endophyte produces alkaloid compounds that are toxic to ruminants and which can result in fever, fat necrosis, tail sloughing, abortion, and even foot sloughing. Many farmers in the ‘fescue belt’ of the U.S. have learned to live with endophyte infected tall fescue, but it is far from ideal in most situations. Forage quality and yield: As with most forage grasses, the forage quality of tall fescue depends on the harvest schedule. Tall fescue is later maturing than orchardgrass. If it is harvested on time, the quality can be very good. Including red clover in the seeding mixture with tall fescue can improve yields by 30% or more and increase protein levels by 3 – 5%. Generally speaking the NDF digestibility for modern tall fescue varieties is comparable to orchardgrass. In most forage variety trials across the country, tall fescue consistently delivers a higher yield than any other perennial forage grass species. Even in many of the endophyte-free varieties, the drought and heat tolerance of tall fescue often allow higher yields to be achieved in sub-optimal conditions. Neutral detergent fiber digestibility levels also are more consistent among cuttings than with species that are susceptible to drought. Stockpiled tall fescue for fall grazing; photo by Garry Lacefield. in the season than other forage species. Stockpiling is the planned accumulation of pasture biomass for fall and winter grazing. While this could be done in Vermont, the potential for the practice is lower than it is in areas that do not tend to get more than 6” of snow for extended periods of time. What about invasiveness? In our never-ending and often misguided pursuit of perfection, we often look for that magical forage variety that will maximize yield and quality while having excellent nutrient efficiency, harvestability, and persistence all while not becoming an invasive weed. There are too many plant species that were introduced with good intentions but eventually became the bane of land managers; quackgrass, kudzu, johnsongrass, and canarygrass, to name a few. It is not yet clear whether the non-toxic tall fescue varieties could become invasive in the Northeast as KY-31 has in states like Kentucky, Tennessee, and West Virginia. Plants without the fungal association are known to be less tolerant of stressful conditions, but the plants are still very competitive and persistent in the conditions of the Northeast. Organic farmers should be wary of planting tall fescue because it is difficult to eliminate without pesticides. Tillage practices that are capable of removing tall fescue are expensive, time consuming, and may not be entirely effective. What about palatability? Because palatability is the Achilles heel of tall fescue, it is only recommended for use as haylage within dairy forage systems. While tall fescue can work well in beef and sheep grazing systems, I do not know of any forage specialist (even from the seed companies) that would recommend any variety of tall fescue for a dairy grazing system. In my work as a student at Michigan State University, I assisted with a study examining the palatability of different grass-legume combinations. In these small plots there was every imaginable combination of one grass plus one clover species including: orchardgrass, perennial ryegrass, tall fescue, festulolium, red clover, white clover, and kura clover. When grazed by Holstein steers, heifers, or dry cows, the tall fescue plots consistently received the worst palatability ratings of all the species and often were hardly grazed compared to the plots containing other grass species. 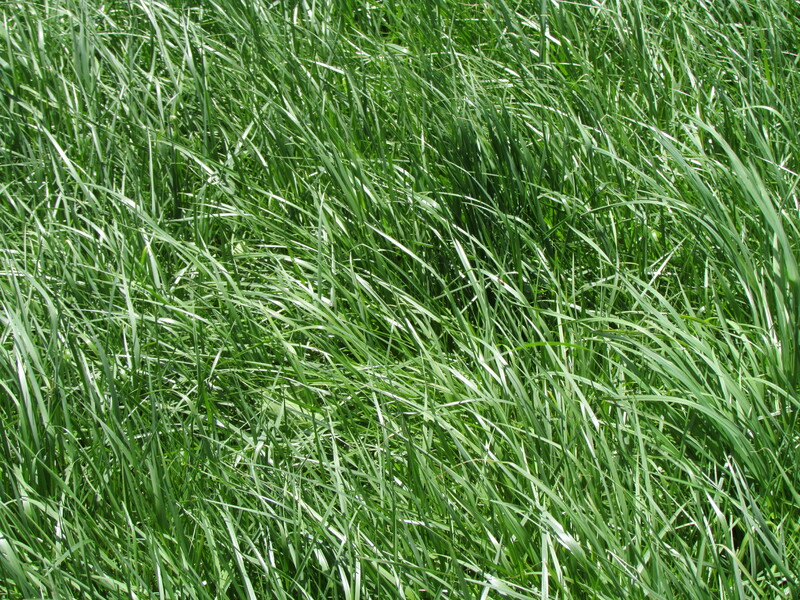 DO NOT PLANT TALL FESCUE IN PASTURES FOR LACTATING DAIRY COWS! 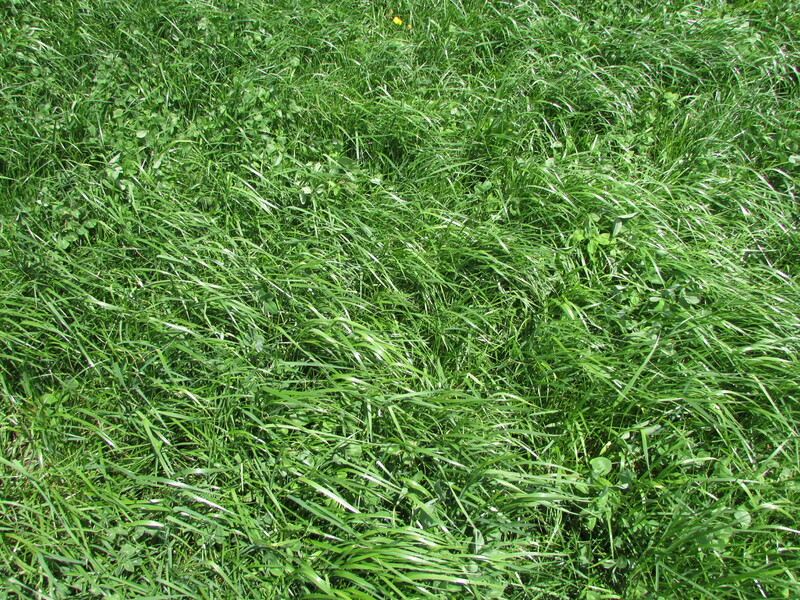 Non-toxic tall fescue can work well in beef and sheep systems, for dry dairy cows, and possibly for dairy heifers, but in these cases tall fescue should be the only forage grass species in the seeding mixture. Including other forage grasses will likely result in extreme selective grazing and eventual loss of the non-tall fescue grass species. Could endophyte-free tall fescue become endophyte infected over time? The toxin-producing fungal endophyte that characterizes Kentucky-31 and other older tall fescue varieties is passed through the seed. The seed becomes infected while it is still attached to the parent plant. There is no known mechanism for an endophyte-free plant becoming infected. This raises the obvious question about how tall fescue became infected in the first place! Nobody seems to have a ready answer for that question, and it is possible that the original infection(s) happened thousands of years ago under very unusual circumstances. That being the case, the literature is in agreement that the only way for an endophyte-free stand coming to have endophyte-containing fescue is through the introduction of endophyte-infected seed. If you plant tall fescue, always select endophyte-free or ‘friendly endophyte’ varieties. There is no known mechanism for the plants established in these systems to become infected with the toxic endophyte. 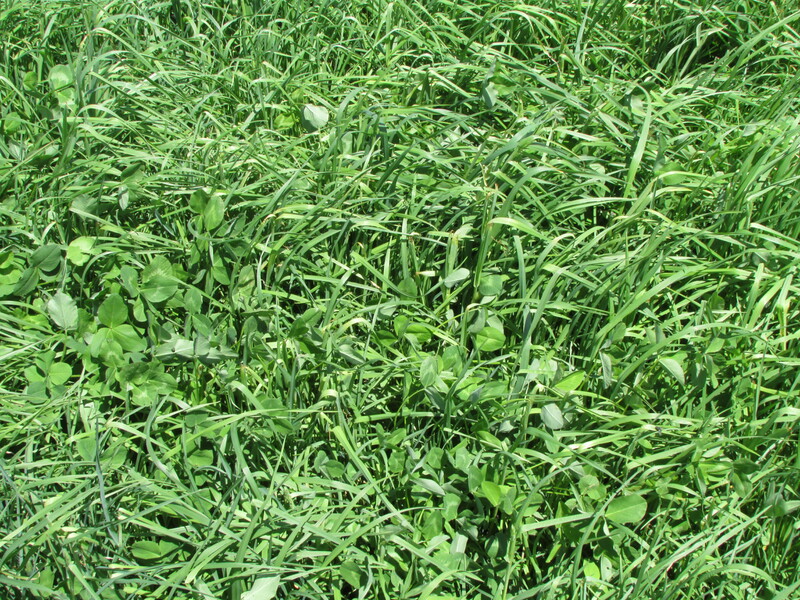 When planted in with red clover in haylage systems, these tall fescue varieties are can give high yields of dairy-quality feed. Tall fescue can be difficult to eliminate without herbicides, so it is not recommended for organic systems unless the producer knows that they want to grow tall fescue on their fields indefinitely.